Cleveland’s four celebrated early 15th-century alabaster tomb mourners are part of a major exhibition this fall at the renowned Rijksmuseum in Amsterdam. 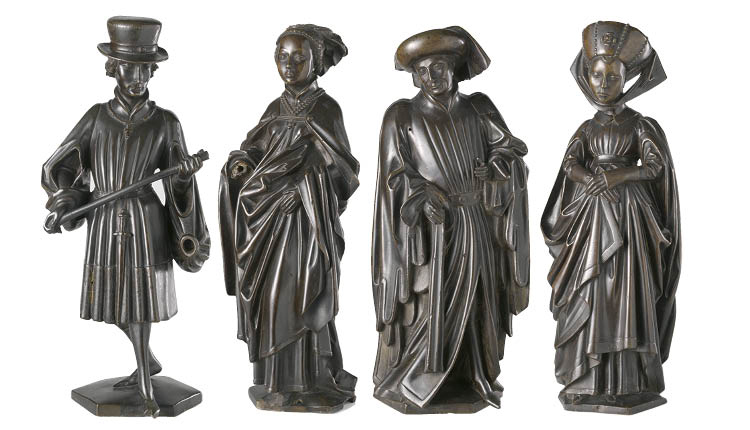 In exchange, the CMA will exhibit four bronze mourners—traveling to North America for the first time––from the tomb of Isabella of Bourbon (1436–1465), attributed to Jan Borman the Younger and with casting attributed to Renier van Thienen. Isabella of Bourbon was the second wife of Charles the Bold, Duke of Burgundy (r. 1467–77); upon his death, their only child, Mary of Burgundy, became duchess (r. 1477–82). 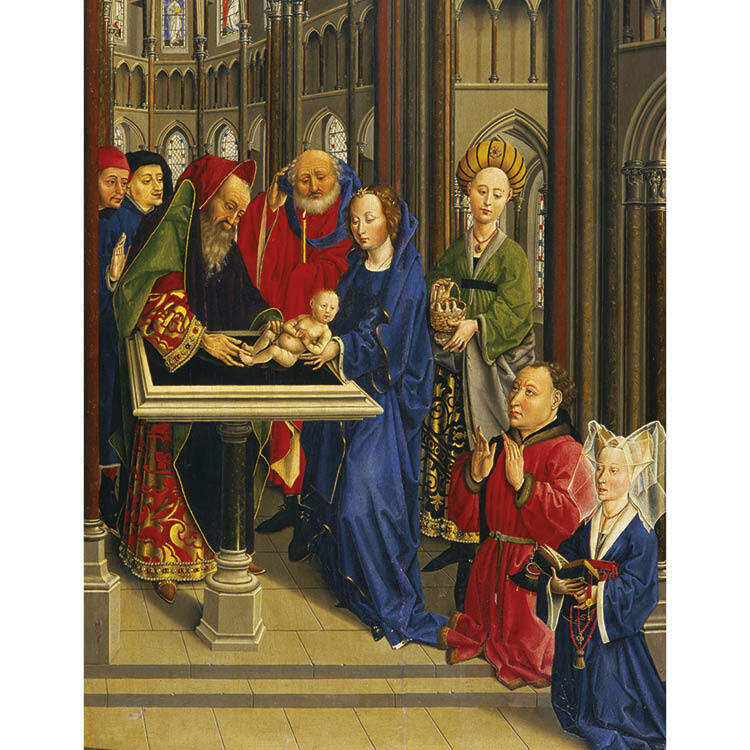 Two years earlier she had commissioned the best artists in Brussels to design and construct her mother’s tomb in Saint Michael’s Abbey in Antwerp. Vandals raided it during the Iconoclast Fury, or Beeldenstorm (roughly meaning “statue storm” in Dutch), of 1566, removing all of the mourning figures, angels, and coats-of-arms, and destroying the effigy’s hands in the process. Her face still bears scars from their axes. In 1691 Amsterdam officials purchased 10 statues they believed represented various Netherlandish counts and countesses; not until 1951 was it discovered that they were some of the lost mourners from Isabella’s tomb. Burgundian tomb traditions began in 1381 with the building of an elaborate tomb for Philip the Bold, Duke of Burgundy (r. 1363–1404), and continued through the 16th century with tombs for subsequent dukes and their families. Their predominant feature was a procession of realistic mourning figures located beneath the effigy. Over time, these figures became less generic and more like portraits representing the deceased’s distinguished ancestors, such as those from Isabella’s tomb. Historical records reveal that 24 figures originally surrounded her effigy, themselves modeled after a tomb in Lille commissioned by Philip the Good. Eight of her surviving mourners are identical to those located in the Lille tomb. 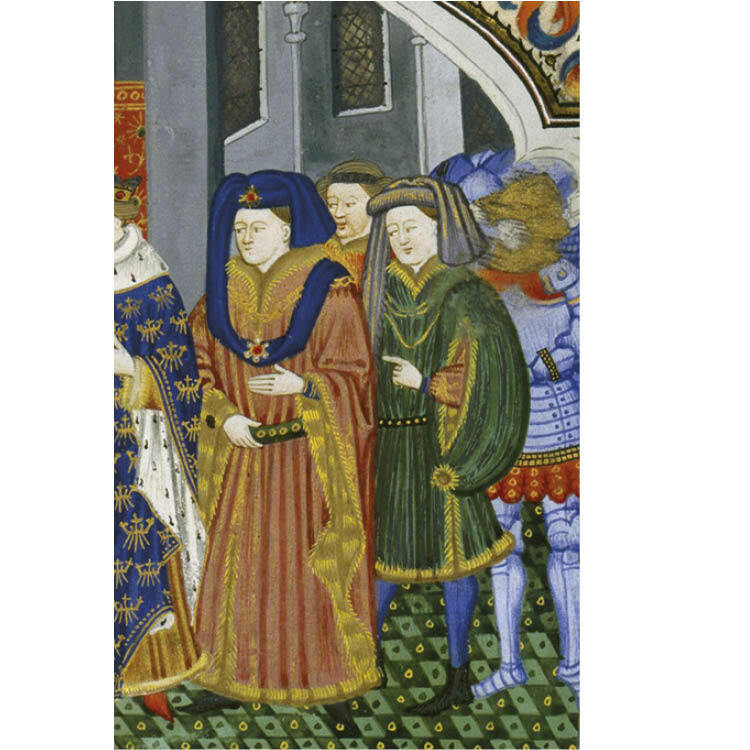 The Burgundian court was known for its sumptuous attire, an outward indication of rank, wealth, and power; Isabella’s mourners wear the fashionable dress of the early 1400s. Based on historical records and the figures’ detailed, opulent costumes, a few of them can be identified. For example, Albert I, Duke of Bavaria (1336–1404), is depicted with the Order of Saint Anthony around his neck. He wears a houppelande,a voluminous garment with wide sleeves worn with a tight belt around the waist to create uniform, fluted pleats. Embellished with a fur collar, cuffs, and trim, it also features bag sleeves that he wears two ways: one hand occupies the larger sleeve opening, allowing the fabric to hang down; the other emerges from the traditional lower opening. 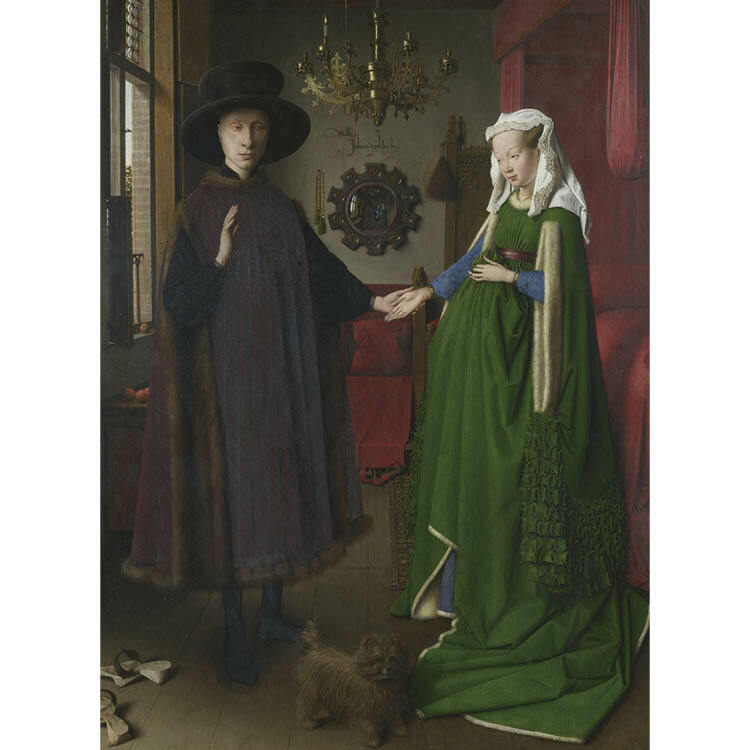 Indicated by a pattern of finely engraved lines, a fur hat completes his fine ensemble, emulating the height of fashion, as also seen in Jan van Eyck’s renowned painting of Giovanni Arnolfini. The other male figure wears a longer, more traditional houppelande with padded shoulders or mahoîtres popular in Burgundy in the mid-1400s. On his head is a chaperon with a bourrelet or ring-shaped turban with a trailing streamer. Favored by French and Burgundian courtiers as a sign of prosperity, those worn by nobility used more fabric to create a larger bourrelet. He also wears a long fur-lined robe with wide decorative fur-trimmed sleeves. The robe, belted tightly at the waist, features a long slit up the front that reveals his hosiery. The female attire is even more opulent. The excess fabric of one figure’s long houppelande pools onto the floor, a sign of wealth. She has a similarly long cloak fastened across her shoulders, the ends of which are held up over her arms, allowing her to stride forward. The simple hood placed over her braided hair features a trailing veil. The Burgundians were known for their love of jewelry; her cross-shaped pendant, likely made of gold, includes large semiprecious stones. Another lavishly dressed female with a partially shaved head wears a striking turban with rows of pearls that is held in place with a chin-cloth. A decorative brooch is the centerpiece of the headgear, much like the figure in a painting from Burgundy of about 1450. The mourner’s long outer garment is trimmed with fur, features wide sleeves, and is belted tightly above the waist. Her dress, although mostly hidden, bears wide fur cuffs and the pleats associated with a houppelande. 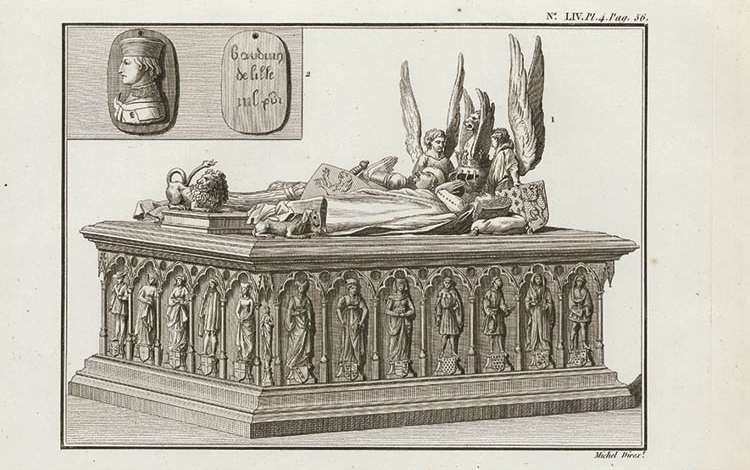 Although little is known about Isabella of Bourbon’s life, her surviving tomb figures testify to the lavish lifestyle, power, and wealth of the Burgundian court. The lasting legacy of Burgundian memorial art cannot be exaggerated, and the opportunity to see these is not to be missed.